I happened to have a sheet of gold foil left over from a previous job (making a load of chocolate Oscars). It is amazing what you have lying around when you never throw things away! The foil is thin and not very strong so I stuck it to a sheet of cellophane using PVA glue. This did the job as the reinforced foil is a lot stronger and easier to use, however PVA was probably not the best choice of glue – it needs air to dry so will probably stay wet for ever. 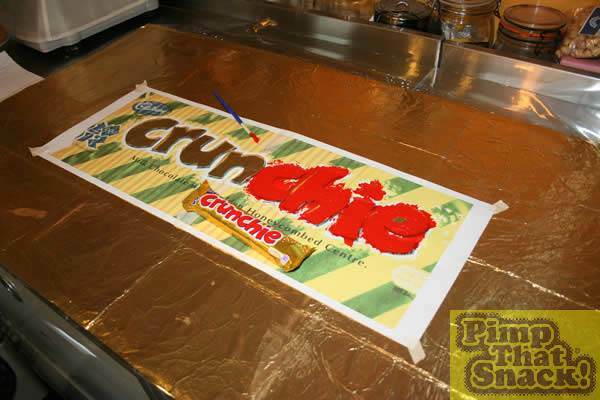 The next stage was a bit of fiddling around with the scanner, scanning a genuine Crunchie wrapper and enlarging it to the right size. I decided to go 4 times as big as the original – 4 times the height, width and depth should be perfect. As my painting isn’t good enough to do it freehand, I printed out the enlarged image and cut out the text to form a stencil so I could paint the red part of the logo. When this had dried, I added the white border, and then the gold border. I used acrylic paint as I happened to have some lying around. When it had all dried, I put on the finishing purple touches with a Sharpie. I didn’t have a suitable mould lying around so I was forced to make one. A sturdy cardboard box was hacked to pieces and then carefully reconstructed. It was then deconstructed and hacked a bit more to make it the correct size (measure twice, cut once…). The cardboard box as then lined with baking parchment so that the toffee filling wouldn’t stick. 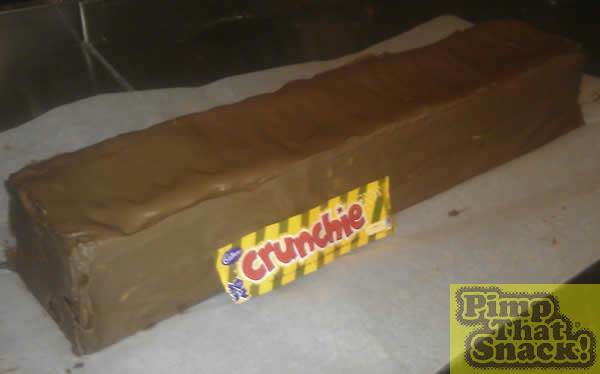 The filling in a Crunchie is honeycomb, also known as cinder toffee. 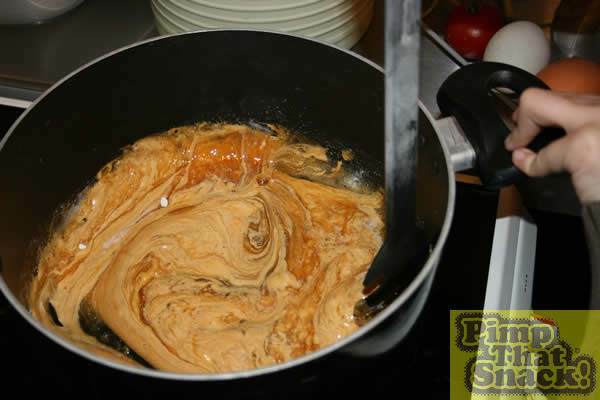 To make any type of toffee it really needs to be a dry day and not too humid otherwise the moisture in the air will make the toffee too sticky. As I live in England and it is summer, I had to wait a couple of weeks for suitable conditions. To make the cinder toffee you need a big pan as the sugar mixture expands to about 4 times the volume of the original ingredients. My recipe is 350g sugar, 100g honey and 100ml water – heat it gently and stir until the sugar has dissolved and then boil it without stirring until it reaches 160C. 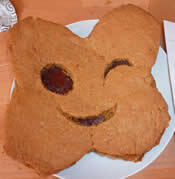 Remove from the heat and add 1½ teaspoons of bicarbonate of soda then mix it well. Once the first batch was ready I poured it into the mould. Whilst it was cooling and setting I made another batch. And another. And another. Finally, the mould was full, so it then needed to cool down to room temperature. Meanwhile, the left over cinder toffee was consumed by the quality control department (the rest of my family). 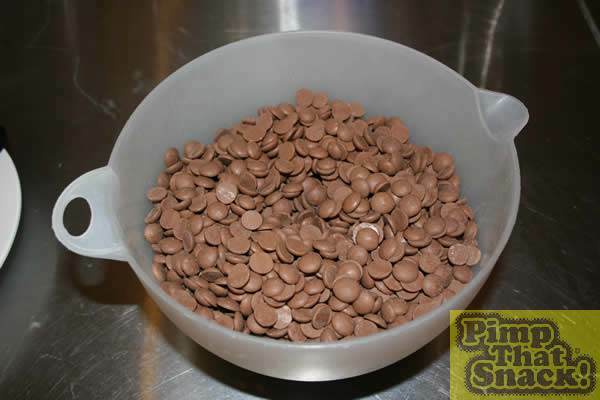 As I am a chocolatier, I happened to have a load of chocolate lying around as well. I used milk chocolate made by Barry Callebaut, I guessed that I would need about 1kg to give a good covering all over. 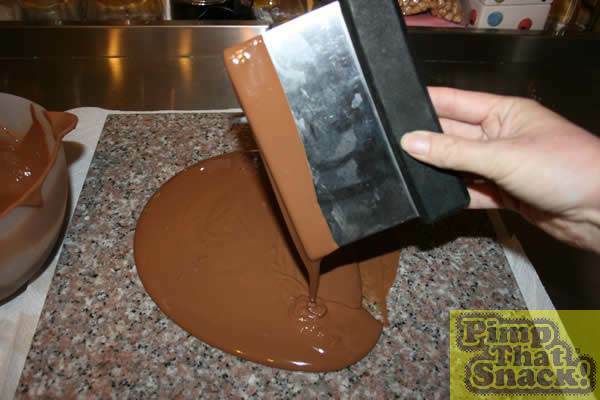 In order for the chocolate to be at its best, it needs to be tempered. This is the process used to give the chocolate the right crystalline structure so that it is shiny, doesn’t melt too easily and isn’t too soft. If the tempering process isn’t done then the chocolate will bloom, this is where the fats separate and rise to the surface giving a white powdery coating (it is still edible, but the taste and texture aren’t as good). Firstly, the chocolate needs to be melted in the microwave. Short bursts then stir so it doesn’t burn. When it got to about 40C it had all melted and the house was filled with a lovely smell. The next stage is to cool the chocolate down. I use the traditional method of a stone slab, pouring about 2/3 of the chocolate out and then moving it around with a pastry scraper until it had reached 27C. At this point the correct type of crystals start forming. The final stage is to mix all of the chocolate back together, temperatures are important here as well – for my chocolate I was aiming for 29C-30C. This stage melts the unwanted forms of crystals that start forming leaving perfectly tempered chocolate, if it goes too hot then I would need to start again, if it was too cool then a very quick burst in the microwave would bring it up. I hit 29.7C – perfect. First of all, I turned the honeycomb upside down and put a layer on the base, then flipped it back and poured a good layer of chocolate along the top. It started running down the sides so I helped it along and gave a good covering all over. Finally I stuck a sheet of greaseproof paper all around the edge – this enabled me to get a nice smooth finish and stopped the chocolate running down before it set. Tempered chocolate doesn’t take long to set so within a few minutes it was starting to go solid. Rather than risk taking the paper off before the chocolate was properly solid, I decided to play it safe and left it an hour before removing the paper. Carefully lining up the logo with the top of the bar, in best Blue Peter fashion, I used double sided sticky tape to seal the cellophane together. A few photos and it’s all done! The finished product weighs exactly 2kg. 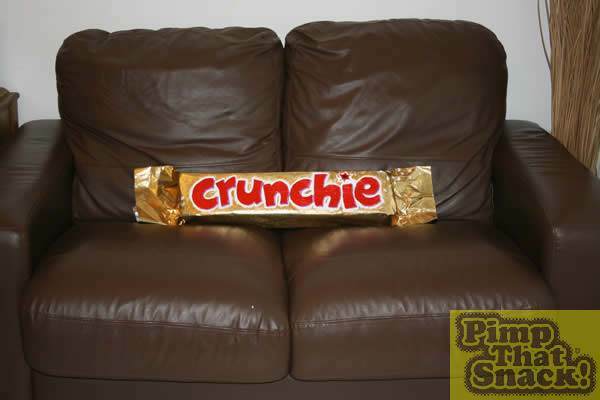 Should be perfect for a healthy afternoon snack.